The A.B. CHANCE Helical Pier Foundation Systems are a very effective solution for building where fill areas, expansive soils, high water tables, and other areas where unstable soils require added support. CHANCE is the only company with a pre-engineered and manufactured underpinning system assessed and confirmed by all of the national building code agencies. CHANCE® Helical Piles offer the performance of concrete without the high mobilization costs and liabilities of driven or auger-cast piles and drilled shafts. The Helical Pile method is a time-saving and cost-effective deep foundation solution that uses instant torque-to-capacity feedback as a built-in means of quality control. Pair Foundation Solutions offers this service in order to prevent the likely chance of structural settlement in these soil conditions. If loading requirements call for heavy capacities Pair Foundation Solutions can offer a solution using the CHANCE Helical Pulldown™ Micropile. By using this system you will obtain the same advantages of the pre-engineered helical system to the heavy micropile and anchoring markets where we can provide tension loads of 70,000 lbs to 200,000 lbs and compression loads of 20,000 to 400,000 lbs. 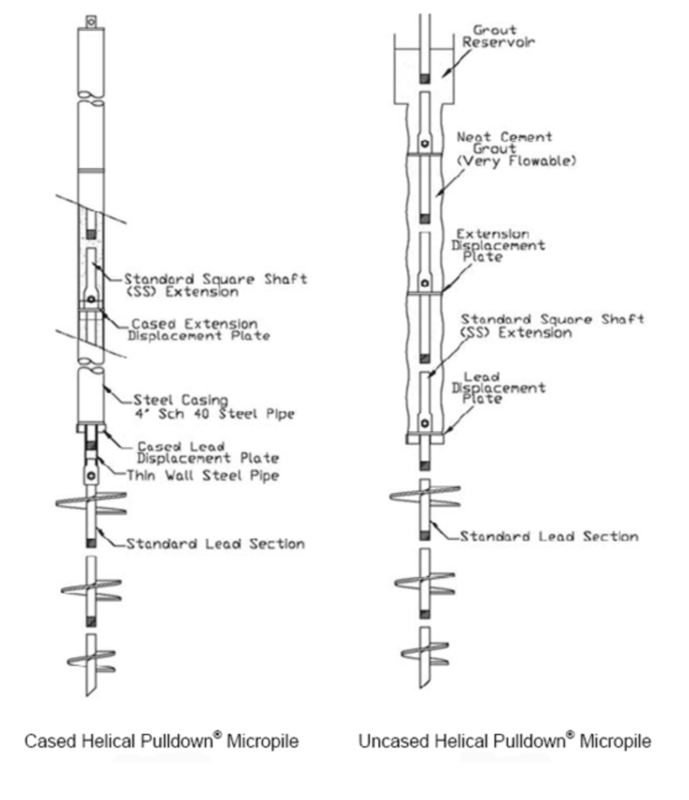 The Pulldown™ Micropile is a time efficient high capacity pile system that is constructed by strengthening the helical pile shaft with a grout column. Adding a high density grout column will provide increased resistance to buckling in weak sub-surface soils while guarding the pile against corrosion in aggressive soils. By combining the friction of the grout column with the end-bearing helical piles, load capacities can be significantly increased.